It was only about a year ago when I picked up my first copy of the magazine Real Simple and while reading it, my quick browse soon turned into a full blown peruse. I like it. The mag is like Martha Stewart Living only more practical and not so hoity-toity when it comes to cooking, and gardening, and well... life in general. Now now, I have the utmost respect for Martha and the empire she has built, I really do. 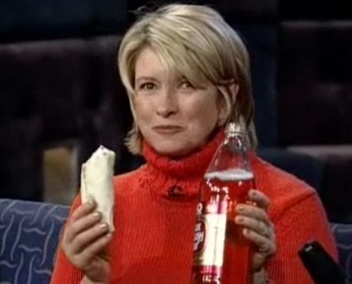 I may be a big fan but nevertheless, it's still fun to post screenshots of her drinking an Olde English 40oz malt liquor and eating a Taco Bell burrito on Late Night with Conan O'Brien. You can watch the whole clip here. You didn’t read the recipe all the way through before you started cooking. You didn’t preheat the pan, and your fish fillets turned out soggy. You cooked pasta in a small pot and ended up with a pile of gummy noodles. You used dried herbs in a recipe in place of fresh ones, resulting in a heavily overseasoned dinner. You fried food in oil that wasn’t hot enough. You thought it was sugar, but it wasn't. The last person to wash the blender didn't screw the bottom on tight, and you just made margaritas. You forgot to rinse your beans and now you just poured wall paper paste on your salad. You got all wrapped up playing Cranium and scorched the Thanksgiving turkey. "Baking Powder, Baking Soda... what's the difference?" "Jalapeno... Habanero, what's the difference?"